Review: Noodles, markers, and strange foreign cousins. Do you like….well…most of these? If so, you’ll love Noodle Pie by Ruth Starke! It’s about a young boy discovering family, friends, and strange (but delicious!) Vietnam cuisine. 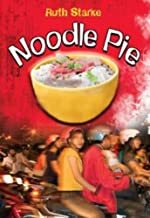 Noodle Pie is centered on Andy, a boy from Australia who has no idea of his Vietnamese heritage. Andy goes to visit Hanoi, Vietnam, where he is called Anh. When he arrives with his father, he finds his extended family lined up from the most important person in the family to the least important person. The very last person is a girl named Minh, because girls are not well-respected. Her parents are divorced, and she is the daughter of the youngest girl. When they get to the house and restaurant, Andy is so surprised! The restaurant is not at all like Aussie restaurants. It's dirty, small, and doesn't even have tables and chairs. Andy’s father brings a lot of gifts for the family; a rice cooker, pots and pans for the family restaurant called Phuong Nguyen, a Game Boy, and rainbow colored gel pens. While on the plane, Andy is very confused, yet astonished. Back home in Australia, his father is only a gardener, yet he's wearing gold rings, expensive suits, and nice watches! Andy is anxious to know the truth. Later, when all the gifts are being handed out, Andy sees the light and decides to give a very special box of gel pens to Minh. There are glitter, fluorescent, neon, and metallic pens, with 'every possible color gradation and type'. Andy gives her the whole box, and watches her face light up as she looks at it. Unfortunately, his Auntie Mo is very disapproving of this behavior. Usually in every fairy tale, there's a greedy, mean and selfish person. Auntie Mo is that person. After she makes Minh say a very formal thank-you, Andy reflects on how none of the other relatives said thank-you, including Auntie Mo. One night later, Andy is awakened at about 5:30 in the morning by a loudspeaker announcing the daily news, since most Vietnamese don't have the money for a newspaper or a radio. After a breakfast of pho (noodle soup), baguettes, and bananas, Andy, Minh, and their grandmother go to the market to buy food for Phuong Nguyen. Along the way, Minh gives Andy a new nickname: Noodles, because he ate his pho so slowly! So, 'Noodles' tries to get back at her by calling her 'Cheeky'. A little bit later, Andy goes to the restaurant to help out. He's very surprised to see his aunts kneeling on the sidewalk, chopping vegetables. He's also surprised at the change in Minh's attitude as she laughs and is absorbed in her work. Andy finally starts to wonder where all the customers are, and why they would even come to a place like this. Then, the lunch hour arrives, and Andy is overwhelmed by the stampede of people rushing in for lunch. After the family eats a delicious late lunch, Andy and his father go out to wander the streets. After a few days, Andy sees Minh wandering around. One day he follows her, and discovers that she's selling the pens he gave her! Andy is outraged, and confronts her. Minh explains she is trying to get money to go see her mother in Saigon. After that, Minh and Andy cook up a plan to make Phuong Nguyen even better, with real menus, tables and chairs, and a new name-Noodle Pie! Will they be able to make it work? Will Minh see her mom? Will Andy ever figure out his father? You'll have to read the book to find out! All in all, Noodle Pie was a really good book. I liked how when Andy saw Minh, it was getting very suspenseful until you finally found out what she was up to. Also, I thought all the Vietnamese cuisine sounded really delicious. It made me want to try it, and I'll probably try to find a Vietnamese restaurant somewhere! I also loved all the family connections in this book and how Andy and Minh finally became friends. One thing I did not like about this book was that the extended family was so greedy and ungrateful for the gifts they got. I didn't think real Vietnamese people would be so mean about stuff like that. Also, this book made me really hungry! All the cooking sounded mouth-watering, and I hope I'll get to try some of the cuisine someday. Noodle Pie is a great book, and I hope the author will get to write other books because they'll probably be supreme! We would like to thank Kane Miller for providing a copy of Noodle Pie for this review. Have you read Noodle Pie? How would you rate it?